Engineering Services Examination (ESE), erstwhile known as Indian Engineering Services is an exam conducted by UPSC to recruit engineers as class-1 officers in various departments of the government of India such as Railways, Power, Defence service of Engineers, Central Water engineering, Central Engineering Service, Telecommunications, etc. The finally selected candidates are initially offered the position of Assistant Executive Engineer, and the candidates can rise up to the position of Managing Director/ Chairman in their respective departments. The UPSC conducted Engineering Services Exam is written by millions of engineering students every year, and the number is rising year-on-year, making it more and more intense as far as competition is concerned. To crack ESE, there is no shortcut or magic trick. One need to plan his study and work accordingly. The only thing that differentiates an ESE qualifier from an ESE non-qualifier is that the ESE qualifiers had practiced a lot, managed his time, followed time-table religiously, taken mock tests, and were persistent with their hard work. The challenges that are usually faced by ESE aspirants are exam fear, fear of failure, lack of proper information, lack of guidance, and right resources. All these factors are very important during ESE preparation. However, the biggest challenge faced by an ESE aspirant is the institute to choose for proper guidance and coaching. Selecting the right institution is the biggest decision that is often taken by an aspirant without proper research. To make the dreams of cracking ESE 2020 with good ranking, and that too without thinking much about the monetary part, IES Master – an institute for engineers – has come up with Master Talent Reward Exam (MTRE). MTRE is a national level scholarship exam that is conducted twice every year by IES Master. Currently registrations for MTRE-2 are open. 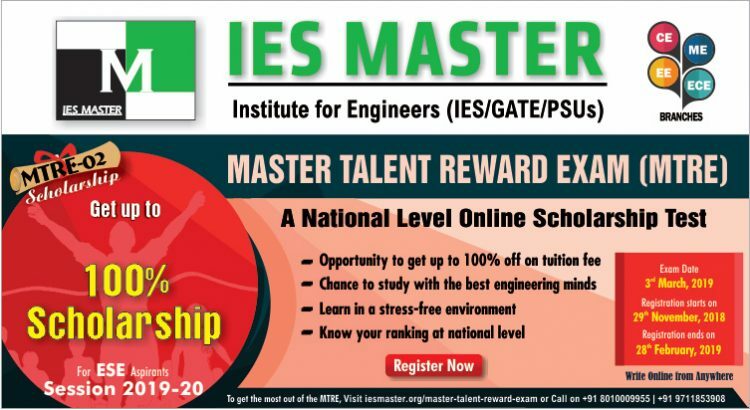 Engineering students, who are aspiring for ESE 2020, and want to carry on with their preparation at IES Master can write MTRE-2 to earn a discount of up to 100% in tuition fee. 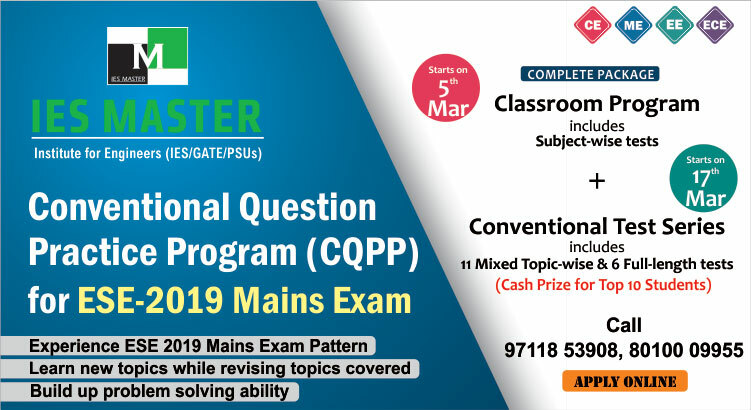 In addition to getting an opportunity to win a discount of up to 100%, by writing MTRE-2, ESE 2020 aspirants will also get an insight into the ESE exam pattern as the questions asked in MTRE-02 match the orientation and level of real ESE. Writing MTRE-2 will also train ESE 2020 targeting engineering students in writing the actual ESE as this national level scholarship exam will be conducted in ESE like environment. MTRE-2 will also facilitate ESE aspirants in developing hand-eye coordination and other required skills that go into ESE exam. As MTRE-2 is a national level scholarship exam for ESE 2020, the students writing MTRE-2 can also analyse their performance and ranking at national level before going to write the real ESE 2020. MTRE-2 is scheduled to be conducted by IES Master across India on 03 March, 2019. So, if you are a ESE 2020 aspiring engineering student, and want to write MTRE-2 then register today for MTRE-2 as registration closes on 28 February, 2019. To know in detail about MTRE-2, contact IES Master Delhi branch at 80100 09955, or IES Master Noida branch at 0120 415 1100. Interested students can also get their queries answered through e-mail by writing at info@iesmaster.org or info.noida@iesmaster.org.